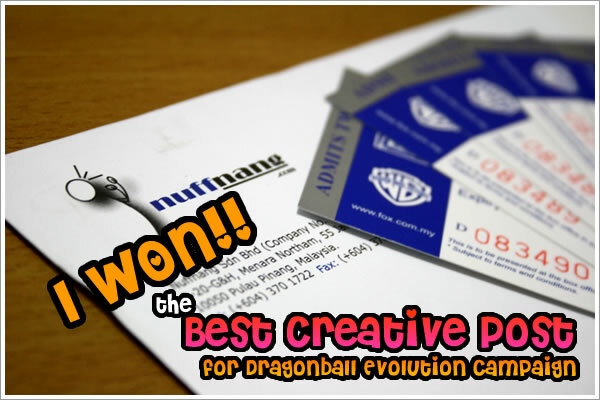 Miao & WafuPafu Comic Blog » I Won the Best Creative Post for Dragonball Evolution Contest!!! I Won the Best Creative Post for Dragonball Evolution Contest!!! Last week, I received a call from an unknown number and to my surprise, it was Robb caling from Nuffnang. Suprisingly, I was told that I won the Best Creative Post for the DragonBall Evolution Campaign Contest with my previous post. It was unbelievable for me as I never thought I would actually win in the contest as I had never win in a contest before. Thank you, thank you, thank you and thank you!! Nuffnang!!! Posted on March 16, 2009 by Jian Akiraceo. This entry was posted in Contest. Bookmark the permalink. u blog are creative enough to win many thing! Congrats… I like your blog design..Nice and cute. Congratulations dude… u totally deserve the tickets ! Have more faith in yourself ya, your work is awesome, if you do not believe me then believe your many fans who always come to your blog !! Reply: I won 5 pairs of tickets to any Fox movie I want in this year. So got my share anot? hahaha. wei later sleep also smile le. btw send me a ticket can boh? Miao… Congratz. You deserve it. hey i think u really deserve it! comic says a thousand words! The 2nd last picture is funny. Nuffnang mascot running bcs of u, ahah! Reply: Woah.. you really expect that eh? Yer gila gila miao hahha. HMPF! U DON’T DESERVE IT..
haha.. ofcoz.. i was just joking.. i see so many “deserve” word all along the comment.. so hmz..
haha.. anyway.. meow meow did it!! yay!! wuahaha.. Jian in heaven dy! geng geng geng geng geng!!!!!!! Hey, yours (contest entry) is awesome. I wonder, got how many winners out there. Hahaha.. dang funny lah, your illustrations. XDXD I hope tonight i won’t sleep-laugh. Haha.